PUBLIC TRANSPORT: Train to and from Ivybridge. Start at Ivybridge train station and take the footpath that heads west on to Cole Lane. Harford Road crosses Cole Lane. Take the right turn which is signposted for the Two Moors Way. Around 200m up hill beyond Stowford Bridge there is a narrow unsurfaced lane which is the start of the Two Moors Way. The lane climbs over a half a kilometre to a gate that opens on to open moorland. From the gate you can climb the steep path due east towards Western Beacon, instead take the gentler diagonal (NE) climb that joins up with the trackway by the Marker Stone (SX651583) - it is marked with "MW" (Moorland Walk) and it is a useful marker if heading back along the trackway. The trackway is a dismantled railway that heads 10k north up to the former China Clay works at Redlake, it is a very prominent and easy to find path much of which is the route of the Two Moors Way. From the Marker Stone keep to the trackway for about 2k as it winds NW and then NE following the contours around Weatherdon Hill. Beyond Hangershell rock the trackway is crossed by the Butterdon Hill stone Row at (SX656598), leave the trackway and follow the stone row north for 1k up to the point where it rejoins the trackway on Piles Hill. Along the way you will pass Hobajon's Cross and the restored Piles Hill menhir. On the crest of Piles Hill are a few prominent cairns and the remains of the Piles hill stone row as this route returns to cross the trackway (SX654611). Note: Double click or use the controls on the map to zoom in for more detail. 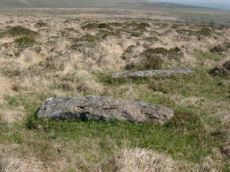 Follow the massive recumbent slabs of the Piles Hill stone row due east downhill. The going is a little rough but not too difficult. Head for Glasscombe Corner which is the wooded area downhill to the east. At Glasscombe Corner cross the West Glaze Brook and continue eastwards. 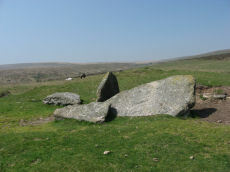 The cairn of the Corringdon Ball group of multiple rows is located just before the East Glaze Brook and can be easily found as it has six prominent standing stones about 0.5m high forming part of the retaining circle on the east of the cairn. The small stones of the two treble rows can be traced back from the cairn. A short distance uphill to the north of the rows is a cairn with multiple stone rings. In the distance to the east the long barrow of the Corringdon Ball Chambered tomb should be visible on the horizon. The East Glaze Brook cuts it way through the landscape forming a pleasant sheltered spot which is a great for a rest or some respite from the wind. Cross the stream and head for the chambered tomb, the Brent Fore Hill stone row, a rather insignificant double row, is difficult to find but is probably easiest to locate at its eastern most end at the site of a cairn a short distance uphill to the west of Corringdon Ball. There is a stile which allows access to the Corringdon Ball hill to the south of the chambered tomb. The terrain is rough going and this section of the walk can be skipped. The area is covered in a rich network of reaves and bronze age fields. Head back to Glasscombe Corner and cross the West Glaze Brook stream. Head uphill in a South-West direction for about 100m to find the Glasscombe Corner stone row. Follow this up hill and continue to head in a south-west direction. This will take you back towards the railway track. The Glasscombe Ball N. Stone Row is a short distance from the trackway aligned SW to NE almost in a direct line with the Glasscombe corner row further downhill. This row is easy to miss as most of the stones are recumbent. Follow the trackway south and after about 500m you can take a short diversion along a path to the left (SE) to take a look at Spurrell's Cross. Return to the trackway and you should shortly arrive back at the point where you left it earlier to follow the Butterdon row north. This time leave the trackway and follow the row south on to Butterdon Hill and optionally on to include the cairns on the top of Western Beacon. There are a number of prominent cairns and boundary stones along this part of the route. From Western Beacon you need to head due west to return to the gate that led on to the moor. From Butterdon Hill head in a south west direction to return to the track and from there to return the way you came on to the moor. The route described above essentially describes a figure of eight. It starts by giving the walker a break from climbing up hill by joining the trackway as it hugs to the contours. For a more strenuous alternative you could head due east from the gate on to the open moor for a steeper climb that heads towards Western Beacon. This route crosses the trackway further south for a steep climb on to Western Beacon. The advantage of this strenuous climb is that the route from here is simple because it heads almost due north following the stones; first the boundary stones up Butterdon Hill and then the Butterdon Hill stone row on to Piles hill (SX654576). A gentler alternative is to follow the length of the Butterdon row from Piles Hill on the return journey by reversing the direction of the northern loop of the figure of eight i.e. on the outward journey sticking to the track passing near Spurrell's Cross and heading down to Glasscombe Corner via the Glasscombe Ball N stone row and back via the Piles Hill row on the return journey, however, this route will be difficult if you don't already know these rows. For an alternative route on to this part of the moor via Davey's Cross see the Ivybridge 3 walk. The walk above could be adapted to include part of the Ivybridge 3 route by heading west from Piles Hill to Piles Gate and then heading south passing Harford Gate and the Butterbrook reservoir (if doing this keep to the west of the reservoir as the area of the Butter Brook just to the NE of the reservoir is very boggy and best avoided). This route incorporates the Lower Piles Cairn & Cist. For a longer walk the trackway can be followed north to incorporate a visit to Three Barrows. Erme Pound is around 5km further to the north of Piles Hill but to get there from the trackway entails a long 1km walk across very rough terrain to Hook Lake.